MJ Arden - Horses, Art, Frugality and Elegant Communication: More new earring with tutorial! More new earring with tutorial! Another pair of new earrings! 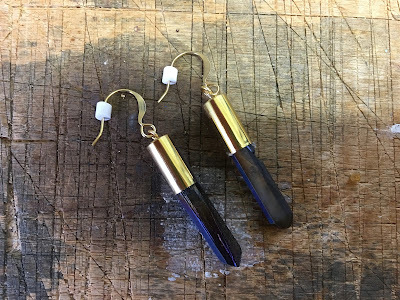 These feature mystic blue quartz crystal points that have been electroplated to increase their beauty and glitzy appeal! Find two similarly sized crystals and make sure they fit into your end caps before you glue them. Slide a head pin into your end cap and make a small loop on the other end to secure it in place. I like to plop in a drop of E6000 for extra holding power. Let dry. Glue the crystal into place-check to make sure you have about the same amount of crystal showing on each earring. Let dry and then attach your ear wire.